WIT + Salesforce = ?? It boggles my mind to think just a few years ago I didn’t know anything about Salesforce. I definitely did not know what WIT stood for or who they represented. How could I not know about this Women in Technology (WIT) movement to promote my own gender in the technology industry? My previous career was not one in the technology industry, and as I think back on the time in my life where I began exploring career fields, I don’t remember giving much thought to a career in Information Technology. Technology is all around us, every moment of every day. It has become a quintessential part of our daily lives. I gave little to no thought at all to a tech-focused career and I cannot fathom why. My story is just one example of how WIT is such an important group. I don’t know why more women aren’t pursuing careers in this ever-evolving industry. 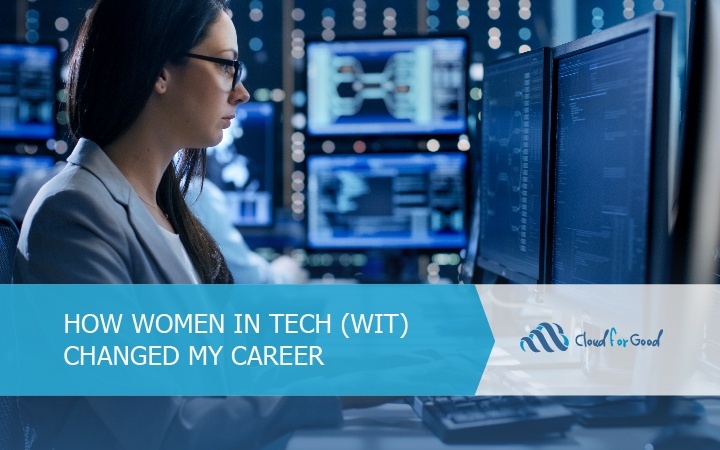 However, I am thankful for the members of the WIT community who are doing their best to get more women involved, because they changed my career path, and my life. Today, I am a certified Salesforce Administrator and Sales Cloud Consultant who is involved in my local WIT User Group. How did I go from not even knowing what Salesforce was to a certified Consultant working for a Salesforce Consulting Partner? WIT. If it wasn’t for one particular woman who was involved in her WIT User Group, who encourages women to explore careers in Salesforce, I would not be where I am today. I was fortunate enough to learn more about WIT and meet a woman who would be instrumental in shaping my career path when my previous company decided to implement Salesforce. I possessed little knowledge of the platform and she shared not only information about Salesforce, but informed me of the career potential Salesforce offered me. It was more exciting than my then current career choice. She enlightened me on the various Salesforce career tracks, what certifications they offered and how to get certified. Once I got started, I was hooked. I knew right away Salesforce was the career path for me. I continued to receive guidance and resources to help me be successful from my “mentor” at WIT. We bonded over the motivation to advance our careers, establishing a relationship that fosters continuous professional and personal growth. She encouraged me to challenge myself and learn more about Salesforce, but that was just the beginning of our friendship. We communicate regularly about tools and skills we are developing and expanding upon. It’s fun when I get to tell her about a tool or skill set she has yet to explore. My life and career were completely changed all because of one woman in the WIT Community. Her only intention was to help, to see a fellow woman take advantage of the opportunity to be a part of the revolution to bring women into the technology industry – and the Salesforce community. One woman decided to share with me her passion for technology and Salesforce and encouraged me to pursue a career in an industry that offered me a future full of potential and growth. All I had to do was go for it. I did it! Through her coaching and encouragement, I quickly discovered it was the best decision I ever made. My story is what WIT is all about. Women helping other women within the Salesforce Community. WIT provides women the opportunity to learn from one another, providing access to other professionals to network with while learning and growing from each other. We strive to inspire others and sometimes find inspiration by sharing stories and experiences. It’s a great place for anyone who is seeking or interested in being a role model or mentor. Salesforce sponsorship of the WIT Community shows how important this mission is to the communities WIT serves. It’s an amazing thing to be a part of – women encouraging other women. This is just one of the many reasons I chose Salesforce and continue to stay involved with my local WIT User Group. The WIT Community continues to grow with around 4,000 members in the Success Community and a number of User Groups all over the globe. If there isn’t a local group near you, Salesforce is willing to sponsor one in your area. Get involved! You may be responsible for changing someone else’s career. Several Goodies have been active with WIT and the Cloud for Good leadership team is sponsoring a breakfast at the upcoming WITness Success Event in Chicago. If you are in the area, try to attend the conference. It’s a great way to “dip your toes in the water” and learn more about WIT. Let us know your thoughts about the WITness Success Conference or share your experiences with WIT in the comments below. Very Interesting. But aside from the Conference in Chicago how do I find out what is available locally?